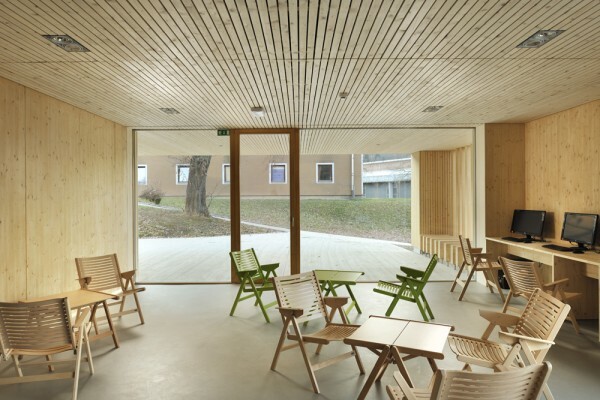 The Punkl Youth Hostel in Ravne certainly represents one of the highest quality works of architecture in massive wood construction in Slovenia. It is distinguished by the convincing hierarchy of the architectural design, which connects the building into an indivisible whole from the scale of the volume to the scale of a detail. This hierarchy results from a carefully planned arrangement of rooms and spaces that enables the compact body to be broken down into smaller volumes. The light fields of differing sizes, positioned with great care in terms of composition, and the controlled dynamics of the lamellae grid facade continue the process of the controlled articulation of the orthogonal volume, ensuring its distinctiveness. Mechanical Installations: RE Ing d.o.o. Electrical Installations: Biro B&J, s.p. Constructors: Kograd Igem d.o.o., Kograd Interier, d.o.o., Instalater d.o.o., Lesnina MG Oprema d.d., Robles d.o.o. Fixtures: Okna Gašper d.o.o., Kograd Interier, d.o.o.